This was originally posted on Dollycas’s Thoughts on October 12, 2010. We return to Sea Harbor, Massachusetts just in time for the holidays. The Seaside Knitters are helping Mary Pisano turn her family home into a wonderful Bed & Breakfast. Her first guests are her family, in town to discuss her grandfather’s will and tie up any loose strings. Mary hopes the relaxed setting will sooth anyone’s feelings who may have been hurt by her inheriting the family home. When they see her renovations how can they not be happy with what she has done with her family legacy. Mary not only has to make her family happy but also her neighbors. One in particular, Henrietta O’Neal, who is doing everything she can to halt the opening of the B&B. But Henrietta is just one small distraction hindering the opening of Ravenswood-By-The-Sea. The bigger distraction is the dead body of Mary’s cousin Pam found on its snow covered grounds. The family reunion has now become anything but relaxing and until the murderer is found all of Mary’s planS for her B&B begin to unravel. The Seaside Knitters are knitting the clues together as fast as they can so that the tragedy will not ruin everyone’s holiday. I am always happy to visit Sea Harbor, even in the icy cold winter. 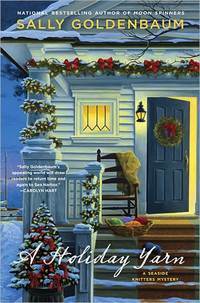 By this 4th sojourn to the seaside village all the characters are now old friends, the shops are decked out for the holidays and the recent snowfall really gets us in the holiday spirit, except for murders it is a truly magical place. Sally Goldenbaum has created a place you will want to visit again and again with words as only she can. This is the perfect story to “Escape” into. Curl up in a nice comfy chair, a fire in the fireplace, a cup of hot apple cider, sit back and enjoy as she takes you back to this seaside town full of the nicest people, but whose reputation for murder, mystery and mayhem will keep you on hooks and needles. And don’t forget the power of mistletoe.